The venue is booked, the dress and suit are chosen, everything is prepared, just the little touches left to be decided, now what about the wedding cake? Everybody knows that the cake is thought of as the centrepiece of the wedding, is proudly displayed for all to see and is considered as important as which car is chosen, how well the Bride's dress fits her and how happy does everyone look on the day! The cake will be viewed and tasted by the guests, discussed and compared to previous wedding cakes and also featured in important photos to remember the day. So, how can your cake stand above the rest? How can it be admired and discussed by everyone who attended? Is it possible to make it personal to yourself and your future husband and also can it be a treasured keepsake in itself? The answer to all these questions is a wedding cake topper! Wedding cake toppers began to be used in the late Nineteenth Century and they were originally in the shape of a Bride and Groom and were available in different poses. These cake toppers were considered to be something that the Bride and Groom could save as treasured mementos of their special day. Other toppers also started to become popular such as love birds, doves, bells and cupids etc. The materials used to make the cake toppers also expanded, giving Brides and Grooms even more choices. These were the first, traditional wedding cake toppers, something which adorned the top of the cake and usually made out of marzipan or sugar icing. Brides could have a go at making something for themselves or, usually, leave it to the professional who was making the cake. 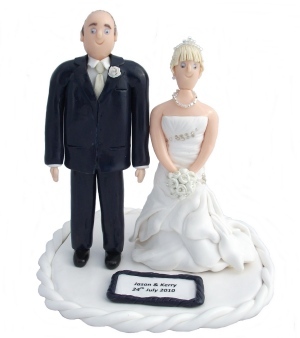 Marzipan Wedding Cake Toppers: These can suit any budget as they can be the cheaper, mass produced standard topper designs and can be in the shape of flowers or your favourite cartoon character or you can even have them designed and made by a professional cake topper maker. You may have to watch the price of marzipan however as it can be affected by the current price of almonds. Sugar Icing Wedding Cake Toppers: Another form of edible cake toppers that as well as providing further photo opportunities, they can also be shaped in various forms. As the desire for more and more unusual and personalised wedding cake toppers increased, so did the desire for the Bride to keep her wedding cake toppers as a memento. With the fragility and tendency for the marzipan or sugar icing toppers, as with a lot of food products, to go mouldy or disintegrate easily, more and more Brides are opting for their cake toppers to be made from a more robust material. However, if the Bride does not wish to keep the wedding cake toppers after the wedding (as there will be countless other mementos of the day) then why not use them as part of your cake cutting ceremony and have the Bride and Groom eat each others 'Bride and Groom' as a humorous photo opportunity!